Hand #125 - (NO-LIMIT) Fred Goldberg has the button, he limps for 30,000, and Mouritsen checks. The flop comes , Mouritsen bets 40,000, Goldberg raises to 140,000, Mouritsen moves all in, and Goldberg quickly calls with for a ten-high flush. Mouritsen shows for a five-high flush, and a runner-runner straight-flush draw for his only outs. Rene Mouritsen is eliminated in second place, earning $125,895. Fred Goldberg wins Event #40 ($1,500 Mixed Hold'em), earning $204,935, a Corum watch, and a coveted WSOP bracelet. 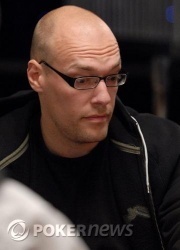 Hand #124 - (NO-LIMIT) Rene Mouritsen has the button, he limps for 30,000, and Goldberg checks. The flop comes , and both players check. The turn card is the , Goldberg bets 45,000, and Mouritsen calls. The river card is the , Goldberg bets 100,000, and Mouritsen folds. Goldberg takes the pot. Hand #123 - (NO-LIMIT) Fred Goldberg has the button, and he folds. Hand #122 - (NO-LIMIT) Rene Mouritsen has the button, he limps for 30,000, and Goldberg checks. The flop comes , Goldberg checks, Mouritsen bets 30,000, and Goldberg calls. The turn card is the , and both players check. The river card is the , and they check again. Goldberg shows to win the pot with a pair of tens, and Mouritsen mucks. Hand #121 - (NO-LIMIT) Fred Goldberg has the button, and he folds. 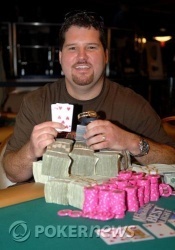 Hand #120 - (NO-LIMIT) Rene Mouritsen has the button, he raises to 90,000, and Goldberg folds. Hand #119 - (NO-LIMIT) Fred Goldberg has the button, he raises to 60,000, and Mouritsen calls. They check down a board of , and Mouritsen shows to win the pot with ace high. Goldberg mucks.